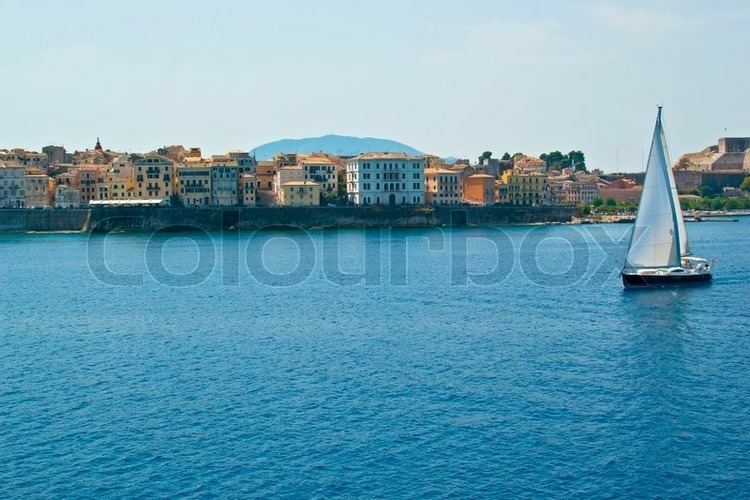 Corfu or Kerkyra (; Greek: Κέρκυρα, Kérkyra [ˈcercira]; Ancient Greek: Κόρκυρα, Kórkyra; Latin: Corcyra; Italian: Corfù) is a Greek island in the Ionian Sea. It is the second largest of the Ionian Islands, and, including its small satellite islands, forms the northwesternmost part of Greece. The island is part of the Corfu regional unit, and is administered as a single municipality, which also includes the smaller islands of Ereikoussa, Mathraki and Othonoi. The municipality has an area of 610,9 km2, the island proper 592,8 km2. The principal city of the island and seat of the municipality (pop. 32,095) is also named Corfu. Corfu is home to the Ionian University. The island is bound up with the history of Greece from the beginnings of Greek mythology. Its history is full of battles and conquests. Castles punctuating strategic locations across the island are a legacy of these struggles. Two of these castles enclose its capital, which is the only city in Greece to be surrounded in such a way. As a result, Corfu's capital has been officially declared a Kastropolis ("castle city") by the Greek government. From medieval times and into the 17th century, the island, having successfully repulsed the Ottomans during several sieges, was recognised as a bulwark of the European States against the Ottoman Empire and became one of the most fortified places in Europe. The fortifications of the island were used by the Venetians to defend against Ottoman intrusion into the Adriatic. Corfu eventually fell under British rule following the Napoleonic Wars. Corfu was eventually ceded by the British Empire along with the remaining islands of the United States of the Ionian Islands, and unification with modern Greece was concluded in 1864 under the Treaty of London. Corfu has a hot-summer Mediterranean climate (Csa in the Koeppen climate classification). Kerkyra, the "Door of Venice" during the centuries when the whole Adriatic was the Gulf of Venice, remained in Venetian hands from 1401 until 1797, though several times assailed by Ottoman naval and land forces and subjected to four notable sieges in 1537, 1571, 1573 and 1716, in which the strength of the city defences asserted itself time after time. The effectiveness of the powerful Venetian fortifications as well as the strength of some old Byzantine castles in Angelokastro, Kassiopi Castle, Gardiki and elsewhere, were additional factors that enabled Corfu to remain free. Will Durant claims that Corfu owed to the Republic of Venice the fact that it was one of the few parts of Greece never conquered by the Ottomans. The Ionian Islands became a protectorate of the United Kingdom by the Treaty of Paris of 5 November 1815 as the United States of the Ionian Islands. Corfu became the seat of the British Lord High Commissioner of the Ionian Islands. 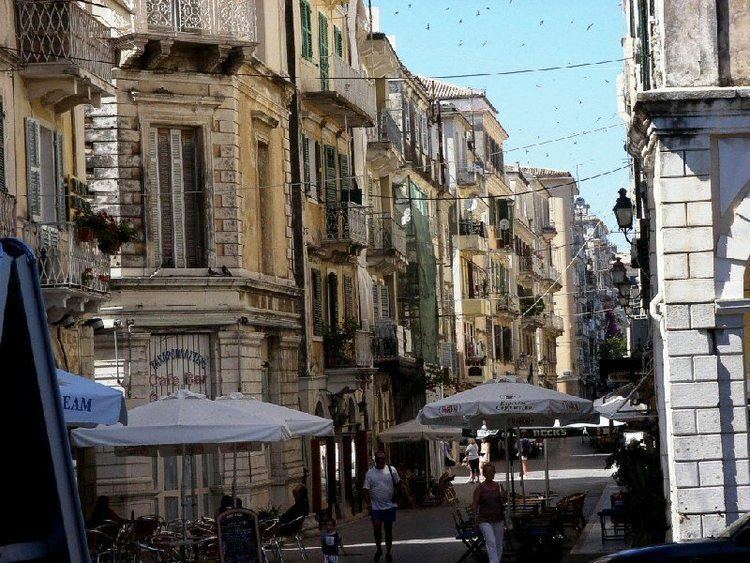 The period of British rule was a prosperous period for Corfu because the Greek language became official, new roads were built, the water supply system was improved and the first Greek university was founded in 1824. The city of Corfu stands on the broad part of a peninsula, whose termination in the Venetian citadel (Greek: Παλαιό Φρούριο) is cut off from it by an artificial fosse formed in a natural gully, with a seawater moat at the bottom, that now serves as a marina and is called the Contrafossa. The old town, having grown within fortifications, where every metre of ground was precious, is a labyrinth of narrow streets paved with cobblestones, sometimes tortuous but colourful and clean. These streets are known as kantoúnia (Greek: καντούνια), and the older amongst them sometimes follow the gentle irregularities of the ground; while many are too narrow for vehicular traffic. A promenade rises by the seashore towards the bay of Garitsa (Γαρίτσα), together with an esplanade between the city and the citadel known as Spianada with the Liston arcade (Greek: Λιστόν) to its west side, where restaurants and bistros abound. The litany is followed by the celebration of the "Early Resurrection"; balconies in the old city are decked in bright red cloth, and Corfiotes throw down large clay pots (the bótides, μπότηδες) full of water to smash on the street pavement, especially in wider areas of Liston and in an organised fashion. This is enacted in anticipation of the Resurrection of Jesus, which is to be celebrated that same night, and to commemorate King David's phrase: "Thou shalt dash them in pieces like a potter's vessel" (Psalm 2:9). Novelist Simon Raven (1927-2001) set 'Come Like Shadows', the eighth novel in his 'Alms for Oblivion' sequence, on Corfu. •Albert Cohen wrote 3 books which are partially or entirely set in Corfu. They are: Mangeclous, Les Valeureux, and Belle du Seigneur. ITV aired a TV series, named The Durrells, in April 2016 and a second series in 2017 with a third being filmed that year. It is a biographical series detailing Gerald Durrell's childhood on Corfu. The buses to the main places on the island run about six times a day between the city and Glyfada, Sidari, Paleokastritsa, Roda and Acharavi, Lefkimmi, Lefkimmi and Piri. Other coaches drive up to twice a day to Athens and Thessaloniki. City buses run through the city to the Airport, Achilleon, Gouvia, Afra, Pelekas and some other places of interest. A bike-sharing scheme called EasyBike Brainbox is available to get around the city.